If you're a professional in just about any field, you've likely heard of LinkedIn. You may even have a profile that you update from time to time. Do you remember when you first made your LinkedIn profile? You may have been thinking, "A social media channel for professionals? Sure, I'll a slap up a quick profile and a picture of myself!" and then promptly forgot your password and haven't looked at it since. Or when you do log in, is it just to congratulate someone on a work anniversary before mindlessly scrolling for a moment and then logging off so you can move on with your day? I get it. That was me, too. And some weeks, I don't look at LinkedIn at all. However, I changed my tune about LinkedIn when I decided that it could actually be an extension of my business website. As I have said before, you should have a website first and foremost. And it should be a workhorse… one that works for you instead of you having to constantly work on it. Your LinkedIn profile should be similar, but it should actually function as an extension of your website. Your website should always be the "hub" for information people may want to know about you whenever they need it. LinkedIn is a fantastic tool for professionals to find you. It has a built-in search function, and you can connect with potential clients, with colleagues and search for professionals who you might be able to hire or partner with in the future. But LinkedIn is more of a directory and a place to post relevant and timely information than anything else. It is not a replacement for a website. 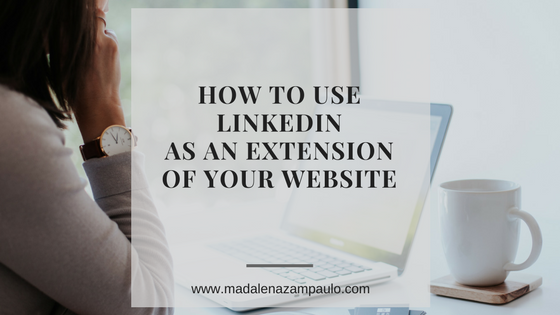 Here are two basic reasons that LinkedIn should be seen as an extension of your website. LinkedIn, just like any social media platform, is "rented" space. What if they disappeared or sold tomorrow? What if everyone goes off to use another new platform? Remember Myspace? It was merely a 3- to 5-year blip on the social media scene. And while LinkedIn has lasted longer and isn't expected to be bought out tomorrow, it's always a possibility. So, treat your profile on LinkedIn (or any other site, for that matter) as an extension of something deeper and link it back to your website. Your website is yours alone. As long as you pay for it annually, it's not going anywhere. Think about this. Where do you go when you want to find out more about a professional service? Most likely, you do a search that leads you to the company's or professional's website that you want to research. Your clients do the same! So, make your LinkedIn profile compelling enough that visitors will want to click over to your website from it. And if you're like a lot of professional translators and interpreters with little time on your hands to make updates to your LinkedIn profile, here are some quick and easy tips to help you dust off your profile and make it work for you. Always make sure your LinkedIn profile directs traffic to your website. Always. It's ok to have more than one link to your website in your profile. Be creative about it and allow people to click from different areas of text or icons so that it doesn't appear to a potential client as spammy. Provide enough information on your LinkedIn profile to make people want to know more about you and your services so that they are more likely to visit your website. This applies to any platform where you can be found in a directory! Make sure your website goes more in depth than LinkedIn, or else your clients who find you and then travel to your website might be disappointed. Remember, first impressions are key, even online! If you want to read more about how to make a lasting first impression with your website, check out 13 Must-Know Tips to Nailing Your T&I Website and Converting Leads into Clients and 9 Ways to Stand Out in the T&I Industry. Don't overshare. LinkedIn is a professional platform, so be careful not to share a lot of personal information in your updates and posts with your colleagues and potential clients. While they want to know you, they don't care to know what you had for lunch today. If they really want to get to know more about you, they will visit your website and read your spectacular "About" page or bio. Use LinkedIn to find people and to be found. When a potential client first reaches out to you, connect with them on LinkedIn. If you have a call scheduled with them about an inquiry, request to connect with them on LinkedIn before the call (not after!). Why? There are two main reasons for connecting this way. First, by connecting at all, you give the right impression... that you are a professional. And this allows both you and the potential client to put a face with a name. They'll feel more like they know you. And secondly, even if the project or long-term relationship doesn't work out, this person will still see updates from you in their news feed on LinkedIn, which keeps you top of mind and relevant. Share information on a regular basis. A good frequency to shoot for is twice a week, but just post as often as you can be consistent doing so. What to post? Share updates on your work that others will find fun or interesting. Share articles. Did you know that you can post full articles that will show up as an update in your connections' news feeds? These articles could be blog posts you've written and want to share more widely. Take the same posts on your business blog and share them to LinkedIn so that others can find them. And remember, always direct traffic back to your website, even in the articles you post. LinkedIn is a great tool for professionals. Yes, it's been around for a while, but it's still very widely used in 2018. I know a lot of people who have received amazing job opportunities through others finding them on LinkedIn. But the one thing they also had in common that helped them land the job? A professional and up-to-date website.